Blue Reflection promises a lot at first glance by seemingly drawing inspiration from popular series like Persona, along with taking the wonderful high school magical girl trope into JRPG land. 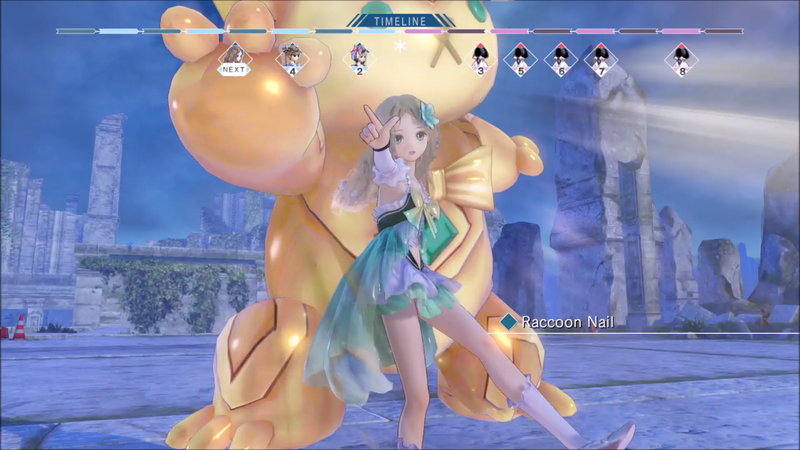 As a magical girl JRPG, it succeeds in a lot of ways with its enjoyable combination of a traditional turn-based battle system combined with active elements and a unique overdrive mechanic. In school life, it's an enjoyable social sim with clear progression that encourages exploration, even if it can feel a little repetitive sometimes. But this didn’t bother me much as between school and magical girl life, Blue Reflection’s enchanting story about emotions and wishes kept me fully engrossed and although it is not without imperfections, there’s a lot to love in this story heavy, magical girl JRPG. Blue Reflection’s emotional story follows the worthy protagonist Hinako, a high school girl previously known for her ballet prowess that has injured her knee badly, preventing her from being able to dance again. As she starts her first day of school, she discovers her Reflector magical girl powers and a parallel world based around this all-girls school where strong emotions can make an individual rampant. It’s up to Hinako and her new Reflector friends to stabilise the fragment within the girl's heart to save her and gain power to take on a bigger threat. The idea of entering hearts may be familiar to those who've played Persona 5, along with a few other beats in the story. 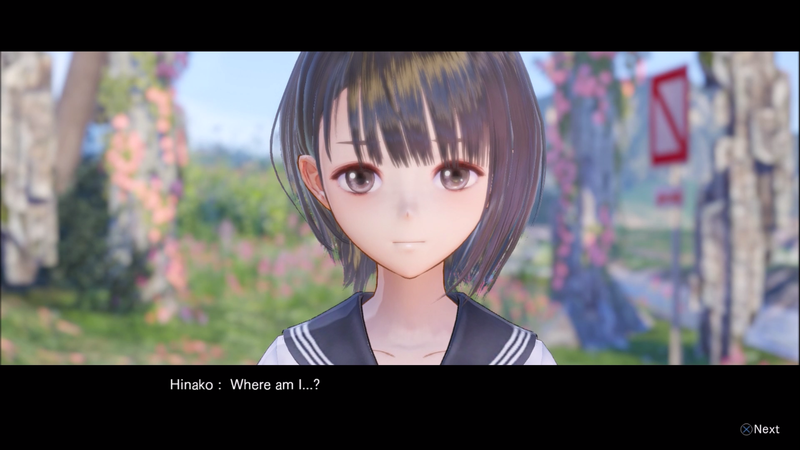 While it seems to take a lot of inspiration from Persona 5, Blue Reflection does manage to feel different in a lot of ways. Each character that goes rampant has their own shining moment filled with plenty of heart and emotion and made me quickly feel attached to those with the hearts I was saving, which came in handy later when it came to building my relationship with them. The story mostly takes place in the all girls school and the four different dungeons, with the simple environment making it easy to focus on the real struggles of the characters around, along with Hinako’s journey in understanding the very different girls more. Hinako is also a very good protagonist, with her growth as a Reflector while dealing with the potential loss of her ballet dreams making her feel much more real than expected and her compassion for others makes it easy to root for her. It’s Blue Reflection’s heart that makes the concept of dungeon crawling to steal hearts its own and the real struggles in it made me want to watch the story unfold. Blue Reflection wastes no time getting into story and its turn-based gameplay, which is good as it’s pretty fun. The sleek-looking turn-based system features a timeline showing your turns and battles revolve around dealing damage and strategically knocking your opponent back from being able to attack you. 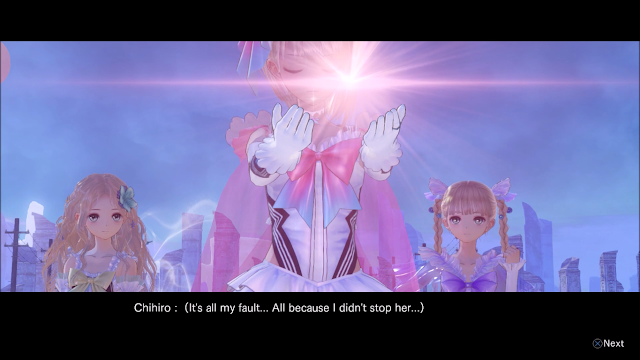 Blue Reflection also features a different kind of weakness to exploit, straying from the usual elements to what seems more fitting for its emotional nature, such as Impact and Heart. What I particularly liked about this system was the way it put in different active battle elements as I progressed through its chapters which all utilise Ether, the Reflectors’ source of magic that goes up or down in percentage depending on actions in battles or whether you charge it yourself. From start to finish, battles went from just exploiting weaknesses to choosing whether to save up my Ether to performer multiple attacks for Overdrive skills or use it up for guarding against bigger attacks. It’s a balancing act I enjoyed a lot, along with the flashy battle moves that went with each action, and together boss battles felt very rewarding when my Ether use paid off. Along with Ether, another important resource for Reflectors are the Fragments gained from within hearts, which can be collected directly by entering a rampant person’s dungeon and also by spending time with previous fragment holders. 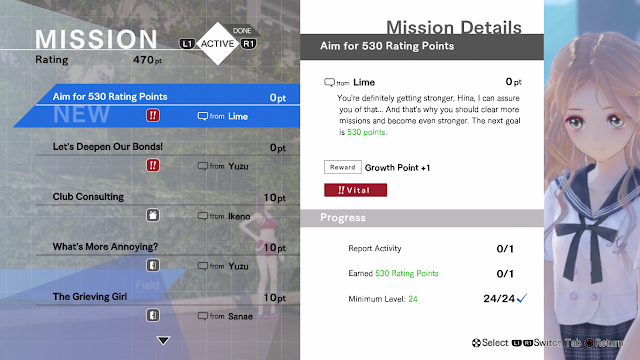 Similar to other games with social sim elements, you can level up your bond with a character by spending time with them and responding to them well, which will often result in a fragment. There is a certain importance placed on this as well, as Blue Reflection’s battles give crafting materials rather than EXP, and replace EXP with Growth Points to distribute for increasing stats and skill learning if enough bonding is done. As most of the games I play with bonding and social elements feature it more as a side element, it was interesting not needing to grind in battles and just go talk to people. On one hand, it did have a tendency to make battling itself feel less useful than it should, particularly since non-boss battles feature similar environments and monsters. On the other hand, since I really liked the characters of Blue Reflection and all of the events I witnessed gave me a little look further into the characters, it was a nice change from what I’m used to. Since talking to characters is more essential in this JRPG, Blue Reflection has its own share of Vital Quests, side quests and mini-games to keep things interesting. A lot of the quests revolve around calming those who have become rampant enough to need saving but don’t have a fragment in exchange for stat boosting items. I enjoyed most of these, other than the fact that the Vital Quests in each chapter required you to do some of these to accumulate points that would allow you to progress the chapter. A lot of these are just your average fetch quests, so around the halfway point of Blue Reflection I found myself choosing the ones with higher point values just to jump back into the story as quickly as possible, not just because the story was good but also because doing the same thing over and over again did feel a little tired, particularly in later chapters. The less essential quests and mini-games were the ones I enjoyed most, such as finding conversation topics around school to text Hinako’s friends about. In fact, Hinako’s cell phone features as wealth of fun as you make new friends, with an addictive monster growing game and other small games and things added when certain friends are made that were nice subtle additions to Blue Reflection and built character. These mini-games are not only enjoyable for what they are, but make Blue Reflection and Hinako feel very realistic. Hinako texts friends and learns the dangers of auto-correct, plays random little games and texts her friends when she sees something interesting. These little things made me get to know and feel more attached to Hinako in a very subtle way while also being enjoyable. As much as I enjoyed Blue Reflection, there are a few flaws and quirks I had to learn to look past in terms of localisation and polish in certain areas. In story moments, the localisation is an interesting conundrum, as with the little Japanese I know and there being no English dub but Japanese audio, I could hear and then read some of the colour they added to make Blue Reflection feel more Western and I truly think they made a really natural localisation that reads almost as well as it would as if it was voice-acted in English. It’s just a shame that by the end of it, I probably ended up with a gallery’s worth of typos and errors in the script that were in moments both meaningful and not, but nonetheless had me sometimes distracted during these points. Outside of cutscenes, Blue Reflection’s gorgeous visuals can also be a little jumpy sometimes, whether it be at the beginning of an attack in battle or running around in school or a dungeon. The jumpiness I found easy to forgive though, as Blue Reflection is generally stunning with its lovely anime-style graphics and soft colour palette that makes it mostly a pleasure to look at. A final random tidbit is that Blue Reflection also knows it has nice graphics and pretty girls and inserts fan-service sometimes at the weirdest times, such as having the camera angle as characters discuss something serious through two pairs of high school girls legs or random locker room moments. I did found this more amusing in a comical way, even if it was also distracting in plot heavy moments. Despite these distractions, I still found myself very engrossed in Blue Reflection's gameplay and story and thanks to enjoying those enough, these issues and quirks ended up mostly out of my mind as I continued through Hinako’s story. When I heard Blue Reflection could be a magical girl Persona style game, I was pretty excited but also concerned as I didn’t see what the magical girl trope could bring to something I already love, but I’m pleased to say I came out loving almost every bit of it. Hinako’s story was easy to get attached to thanks to her growth throughout the story and all the little elements in her high school life that made me feel a connection to her. With beautiful magical girl attacks and transformations, being a Reflector was fun with its mix of active elements into the style of turn-based battle I already enjoyed, along with getting to know the variety of characters’ after each dungeon. Through a critical eye Blue Reflection might not be a perfectly polished experience, but I can honestly say I didn’t want to put it down and there’s a definitely a piece of me that would like to see another of its kind of battle and story-focused gameplay mixed with the magical girl trope again someday. I miss my magical girls, the random teddy bear and this game in general already. You can pick up Blue Reflection on Amazon!